Not all Just Sold postcards are created equally. 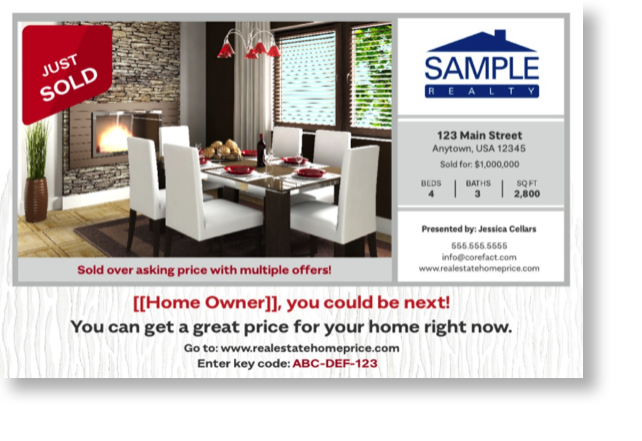 Agents can increase the impact of their marketing spend by utilizing some key elements on their Just Sold postcard. These elements illustrate to your prospects that you can achieve similar results for them by highlighting your recent sales and asking the prospect to take action to move the sales process forward. You can do this by including a solid call to action and adding key statistics which showcase your performance. 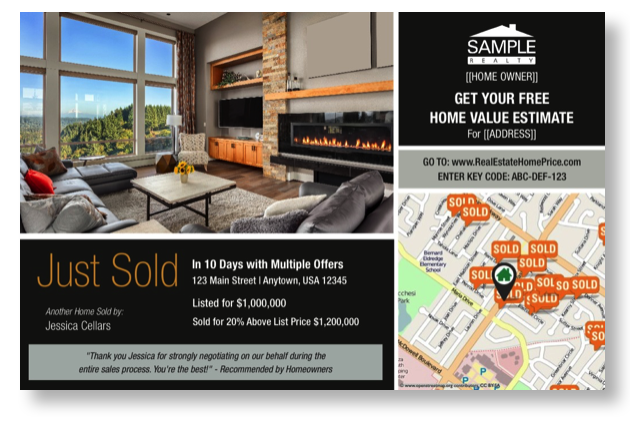 Here are a few sample elements that can really improve your next Just Sold postcard. Percentage of sale price above list price. 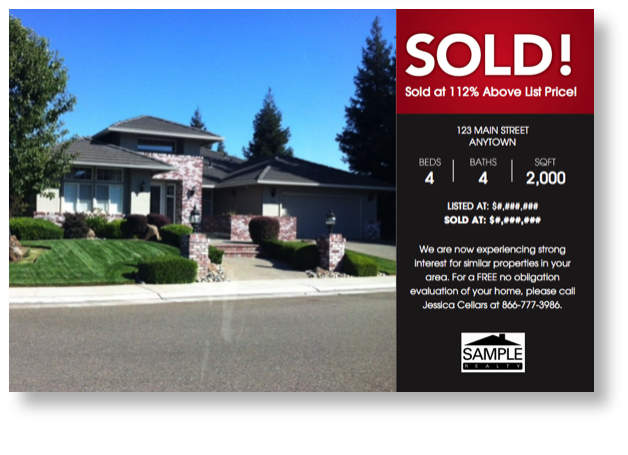 Example: Sold for 112% Above List Price! Number of days on market. 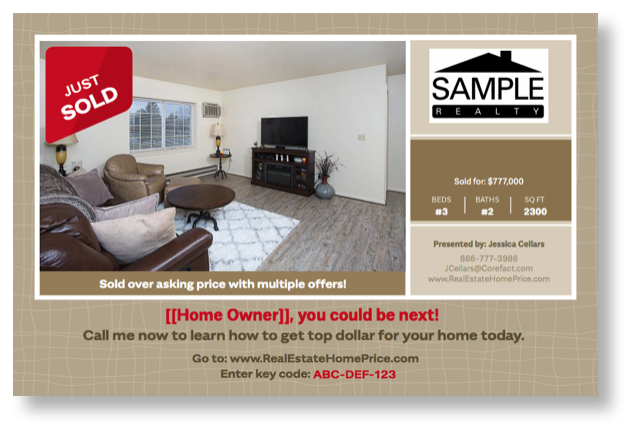 Example: Sold in 7 days! 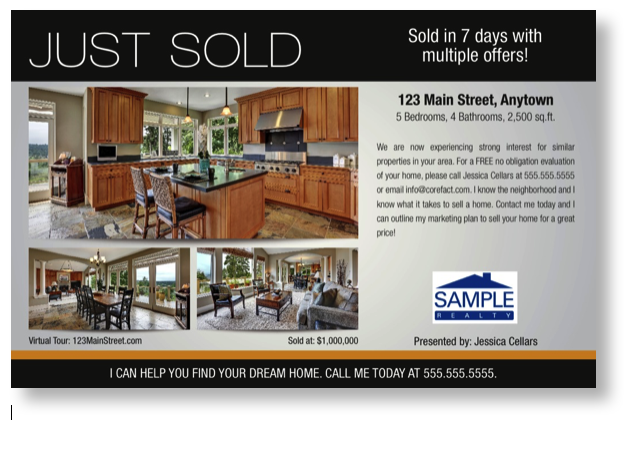 Example: Sold in 7 days with multiple offers! Let them know you have more buyers for their home. 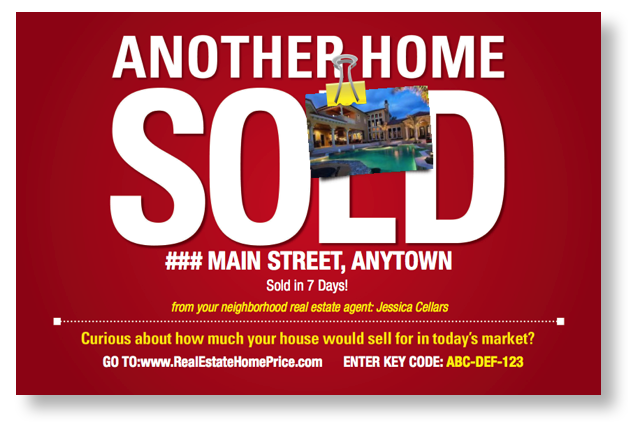 Example: I have more buyers looking for a home in this neighborhood. Example: Call me now to learn how to get top dollar for your home today. Utilize the Home Estimate feature. Use a home estimate feature to drive the discussion online and provide a clear measurement of who is responding to your mailer. Drive your prospects online to learn more about the property. Let them connect with you online and see the rest of your portfolio. With these ideas, you can take your Just Sold postcards to the next level. If you’d like to go even further, make sure you incorporate your personal brand into your design. This will compound your influence with each marketing piece you send out to your prospects. Consistent marketing is the best way to build brand recognition. Corefact Elite sets you up with a stellar 12-month campaign. We handpick the best cards with the highest response rates and run the campaign for you. All you need to do is follow up with your leads and close your listing appointments.